For many of us, space constraints and/or financial constraints make it unpractical to have kilns in our studios. For me, the obstacle was not wanting to shell out the cash for the electrical upgrades needed in my home studio. So, like many of you, I relied on others to fire my pottery until I finally purchased a kiln and made the electrical upgrades If you shuffle work around town, a constant challenge is getting fragile greenware across town in one piece. For this week’s Quick Tip, I have gathered a couple of ingenious solutions to this problem from some of our readers. 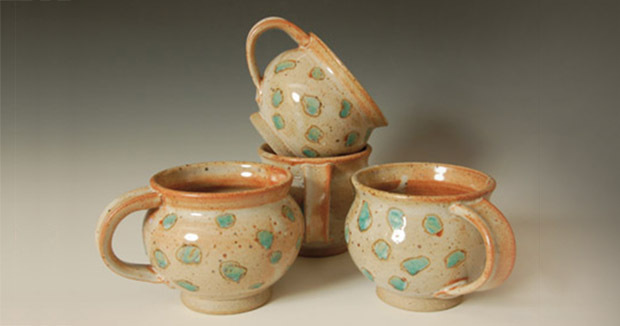 Even if you are one of those lucky ceramic artists who doesn’t have to transport greenware, these tips can be helpful for transporting finished pottery or ceramic sculpture to arts festivals, craft fairs and galleries. – Jennifer Poellot Harnetty, editor. PS. If you have any other great tips for transporting fragile work, be sure to scroll down and post them as comments to this feature for others to see. Balloons – Not Just for Birthday Parties Anymore! Over the years I have used many methods of transporting fragile greenware from place to place with varying success. One of the easiest methods I have discovered for carting greenware over short distances is to use inflated balloons to hold the various pieces in place while in transit. Pictured above is a simple example of securing a greenware piece. For transporting fragile (especially bone-dry ware) over longer distances, I pour a couple of inches of vermiculite (available at garden centers and drywall supply stores) into a box and lay a large sheet of poly cleaner bag material on the vermiculite bed. I then place the greenware piece in the center, bunch the poly sheeting up over the piece and fill the box with vermiculite. The vermiculite can be removed from around the piece with a small hand vacuum, or it can be saved for reuse. With this method, you are able to transport even the most delicate pieces with ease. — David Ogle, Los Gatos, California. I place as many pots as I can in a box without them touching each other or the edge of the box. Cat litter boxes (preferably those that have not been previously used by cats!) work great because they are sturdy and can be used over and over again. Once the pots are situated, I stuff polyester fiberfill (found at fabric and craft stores, used for stuffing pillows, etc.) around each pot. It only takes a second to do this and the fiberfill can be reused as well. Also, the pots look grand protruding from a white cloud of polyester! Be careful with vermiculite. A number of years ago there was a serious concern about asbestos contamination of vermiculite. Maybe something like air popped popcorn would be safer, plus compostable if you didn’t want to re-use it. Also, balloons are a great idea, but please clamp them so they can be re-used instead of knotting them. There is enough plastic debris in the world already.